The INHORGENTA AWARD is one of the most coveted accolades in the jewelry and watch industry. The top achievements in the areas of design, creativity, workmanship, technology and overall concept will be revealed at the award ceremony on February 24, 2019 as part of INHORGENTA MUNICH (February 22–25, 2019). Alongside the nominees, prominent figures from the worlds of business, media and culture will once again be gracing the red carpet at the exclusive gala event on February 24, 2019 at the Eisbach Studios in Munich. “The fact that the INHORGENTA AWARD is now in its third year and the positive feedback that we have received ever since it started prove just how important the award is for the industry. Our top-class jury and exclusive gala evening will help to ensure that the award ceremony attracts attention from far beyond the reaches of the industry itself,” says Klaus Dittrich, Chairman and CEO of Messe München. For the first time ever, the INHORGENTA AWARD will span eight categories: Fine Jewelry, Fashion Jewelry, Designer of the Year, Watch Design, Smart & Connected Watch of the Year, the public choice award Best Piece of Jewelry and the new categories Design Newcomer of the Year and Next Generation Retail. National and international designers, goldsmiths, watchmakers, jewelers, manufacturers and brands and, for the first time ever, up-and-coming talented individuals can submit their designs and concepts up until January 21, 2019 inclusive. The new Design Newcomer of the Year category is aimed at young designers. “Our new Design Newcomer of the Year category gives today’s talented individuals the opportunity to become tomorrow’s major players and use their fresh ideas to help shape the dynamic future of the jewelry and watch industry,” says Exhibition Director Stefanie Mändlein. The winners in this category will be invited to INHORGENTA MUNICH in 2020 and will get to exhibit there free of charge. The new Next Generation Retail category is all about successful concepts. All jewelers are encouraged to submit innovate and market-relevant concepts. There are no limitations in terms of subject matter: from digital ideas, sales and marketing to cross-channel marketing, operational succession planning, design, manufacturing, materials and sustainability—this category is all about best-practice solutions that are making waves throughout the industry. A jury of nine prominent figures will decide on the winners except in the Best Piece of Jewelry category where jewelry fans are being given the chance to choose who wins as part of an online public vote. Alongside jury members such as top model Franziska Knuppe and watch expert Gisbert Brunner, the 2019 panel also features the German actress Bettina Zimmermann (Ein Fall für Zwei), Xavier Perrenoud, watch designer and professor at the ECAL design school in Lausanne, Switzerland, Nicole Erdmann, Digital Editorial Director of Iconist, the fashion- und lifestyle-magazine of WELT and Munich-based jewelry designer Patrik Muff. 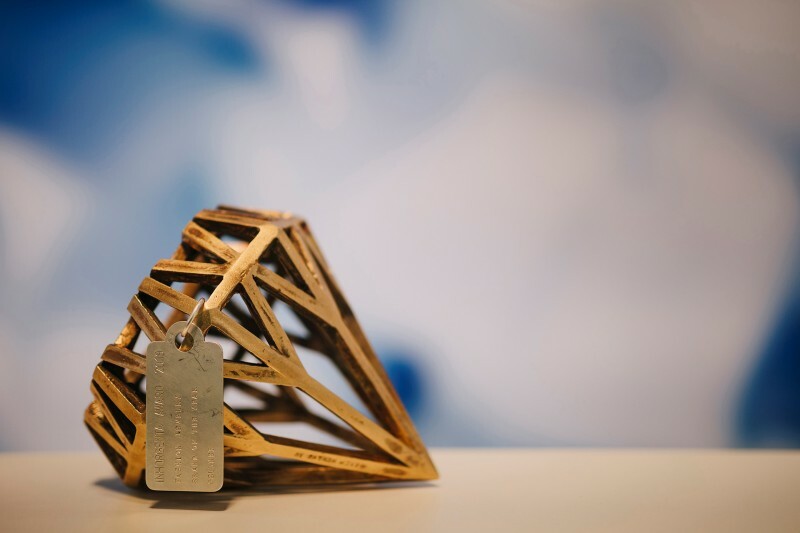 Patrik Muff already has a special connection with the INHORGENTA AWARD, having designed the 3.5-kg diamond-shaped trophy back in 2017, which will also be presented to next year’s winners. The other jury members are Christine Lüdeke (professor at the School of Design in Pforzheim, Germany), Anja Heiden (member of the Wempe Jewelry Management Board) and designer Markus Hilzinger.